Low air loss systems help address “maceration,” a weakening of the skin due to excess moisture. 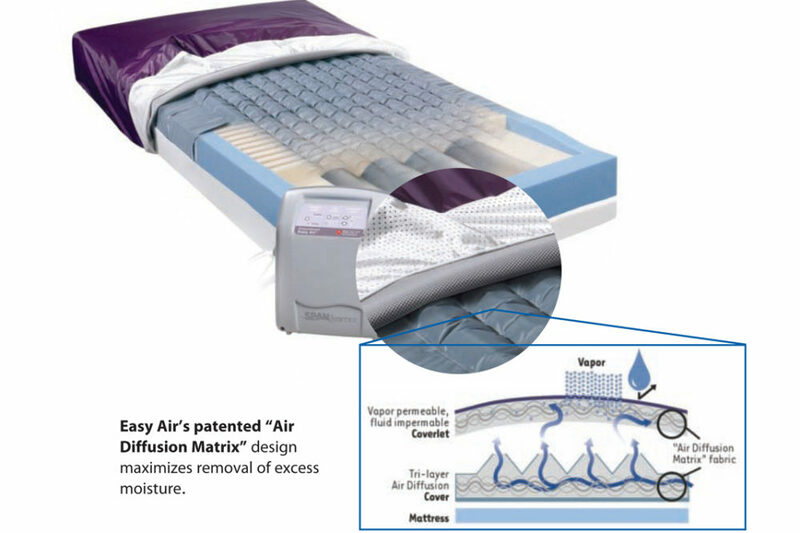 The new PressureGuard Easy Air has been shown in independent documentation to outperform every leading low air loss system in this key area, and it does so without the compromises of other easy air mattresses. Its exclusive “Air Diffusion Matrix” technology (patent pending) and patented PressureGuard air/foam design addresses the issue of maceration with remarkable effectiveness. Easy Air won’t deflate in a power outage, and its highly stable surface doesn’t “swallow up” users. Additionally, transferring on and off the unit is safer with Safety Edge™ technology, and the materials keep users comfortable—never too hot or too cold. Perhaps the most striking feature of the PressureGuard Easy Air is the ultra-simple set up and how easy the mattress is to clean and use. A user-friendly dial sets the comfort level, and “on/off” buttons control air flow and alternating pressure.